Some of you might believe in in Horoscope sign in your daily life, as it may gives you the sign or the personalities of you in the day. 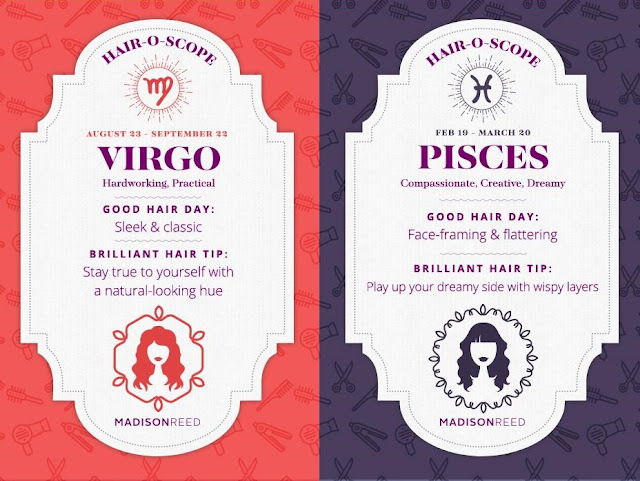 Not just that guys, Madison Reed has approach me to share with you guys about what your horoscope tells about your hair. 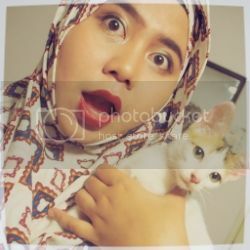 Self-reliant Sagittarius, you inspire the people around you to find their own paths and feel optimistic. It may be all those travel snapshots you share on Instagram! 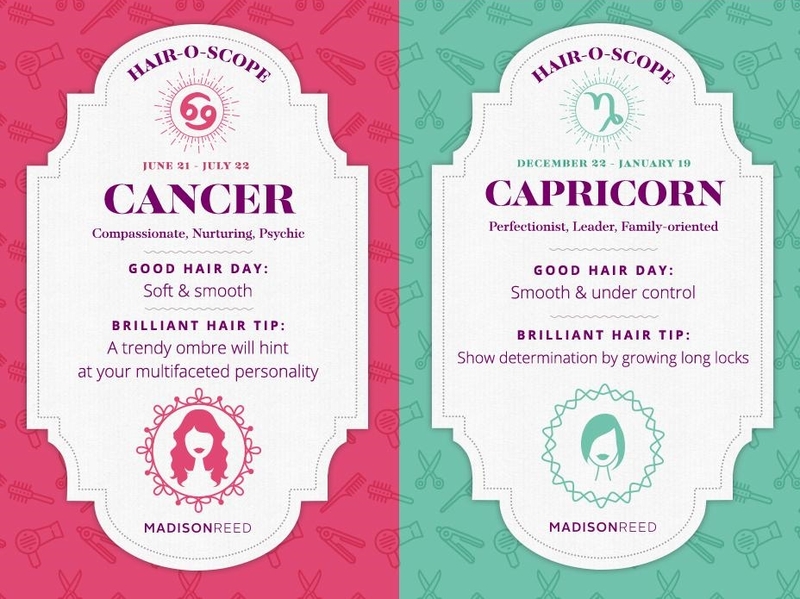 It’s hard for a bad hair day to bring you down, but even free spirits crave a little control. Tame frizz with a lightweight hair primer to add to any style you choose. Then declare independence from salon scheduling with home hair color that frees you up to live your life. You’re definitely a gem, Miss Gemini. Is there anything you can’t do? A Jill of all trades, you’re always on the move, planning the next great idea or adventure, and telling all your friends about it. Your fashion-forward outfits always complement your seemingly always-perfect hair. 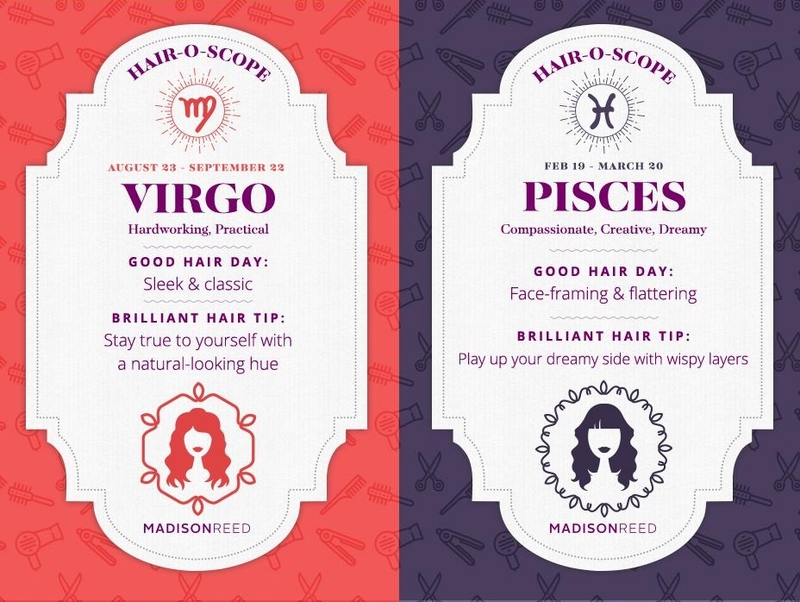 Channel the duality of your star sign with a customized hair color routine that shifts from fiery to icy cool with easy changes of semi-permanent gloss. If you love long hair, ask for layers that flatter your features, or try a short cut that suits the shape of your face. Either way, the world will be your oyster. Ah, the ever diplomatic and noble Libra. You are always fair-minded, and friends come to you for judicious rulings in all matters. We could write a poem about your charm, which we’re sure you’d read and adore… if you hear us over the chorus of your admirers! For a landmark change, try a rich, vibrant color just one shade deeper to convey the gravity of your personal style. Style hair with products that fight frizz while delivering hair care benefits that add softness and shine. You’ll be immeasurably happy with your look. 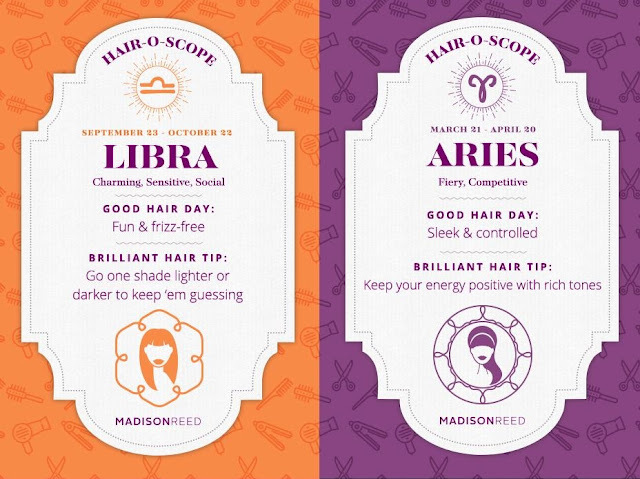 It’s no mistake that you’re one of the fire signs, awe-inspiring Aries. Ruled by the planet of energy and the mythological god of war, you were born to be fierce. You shine in the spotlight, and everyone wants you on their team (they certainly don’t want to be your opponent!). 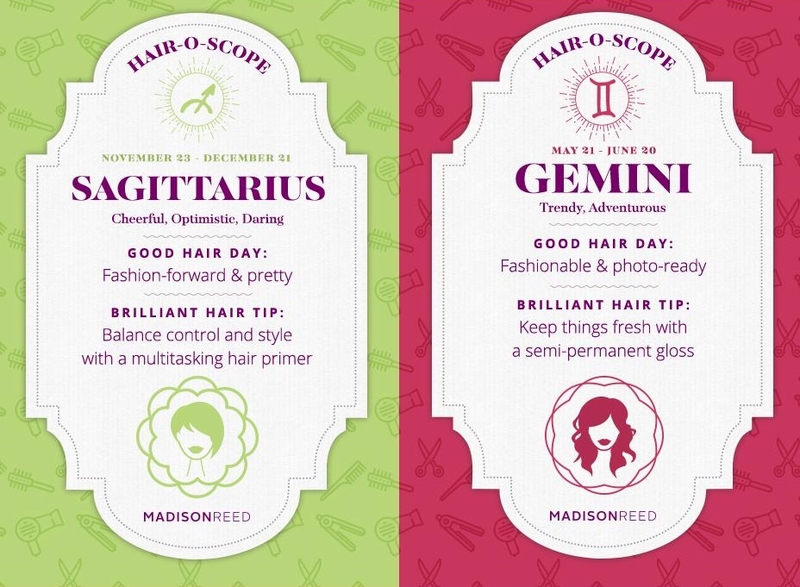 Keep that energy positive by adding rich, vibrant tones to your luscious mane. They’ll showcase the depth and dimension you have in spades. Or channel that prima donna ballerina discipline and pull it all back into a sleek side bun for days when nothing should get in your way. Even the virtuoso Virgo can use some guidance to gain peace of mind. Amplify your perfectionist nature by keeping things simple, so your wisdom shines through. Embrace the concept of perfecting the little details by selecting a hue that’s close to your natural hair color with glints of complementary tones. Let your post-shower waves hang loose, even if just for one day to see how you like it. Discover the joy of unplanned beauty! Compassionate Cancer, your friends refer to you as the psychic mom of the group. If you’re not out searching for antique treasures, you’re at home cooking comfort food (or baking surprise treats) for those you love. Remember to take care of yourself and your hair. Express the many facets of your personality with trendy ombre locks. When it’s time to shine the spotlight on your enchanting face, pull it back into a high ponytail. 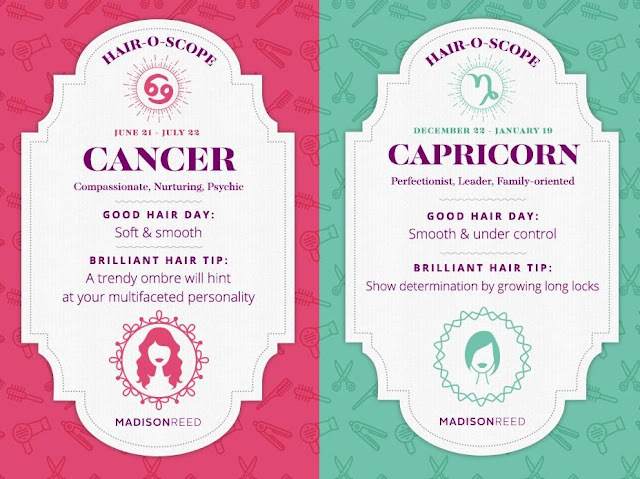 Can we just call you CEO Capricorn? 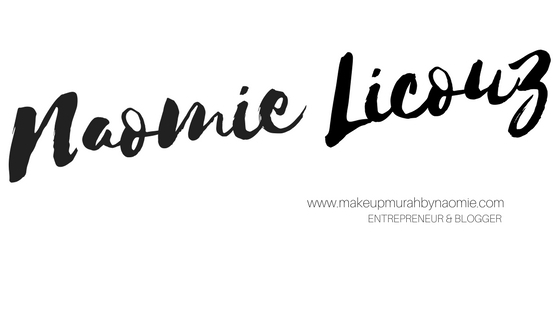 You’ve been known to be a perfectionist with every single hair staying in place (how do you do that? ), and people often look to you for guidance and leadership. As driven as you are, family always comes first, and you’ll always make time to braid your niece’s hair. To help you stay fearless, get your hands on hair color that adds depth and dimension, whether you’re brunette, blonde, or auburn. Use your determination and grow those locks long. Your office strut will be that much more powerful. Or, try something new and unexpected with an asymmetrical bob… just try to resist trimming it back to even layers at home. Mine was in Libra horoscope, and based on that month it say's that I have a fright and frizzy hair. hehehe, Is that true? ermm nope~ I have a long and silky hair. I don't have any frizzy hair but some of you might have the frizzy kind of hair thou. 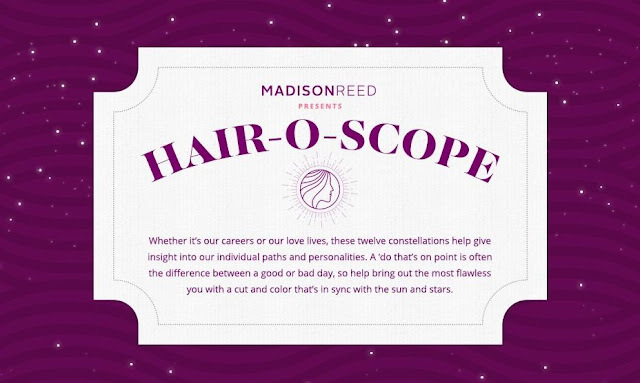 Anyways, you can also try out the Hair Color Quiz here by Madison Reed websites. Do share this articles to your friends.